← MAJOR 7 CHORDS: Which Scales Go with Which Chords? This is the second in a series of articles entitled “Which Scales Go with Which Chords?” covering the Major 7 (-5) and Major 7 (+5) Chords. 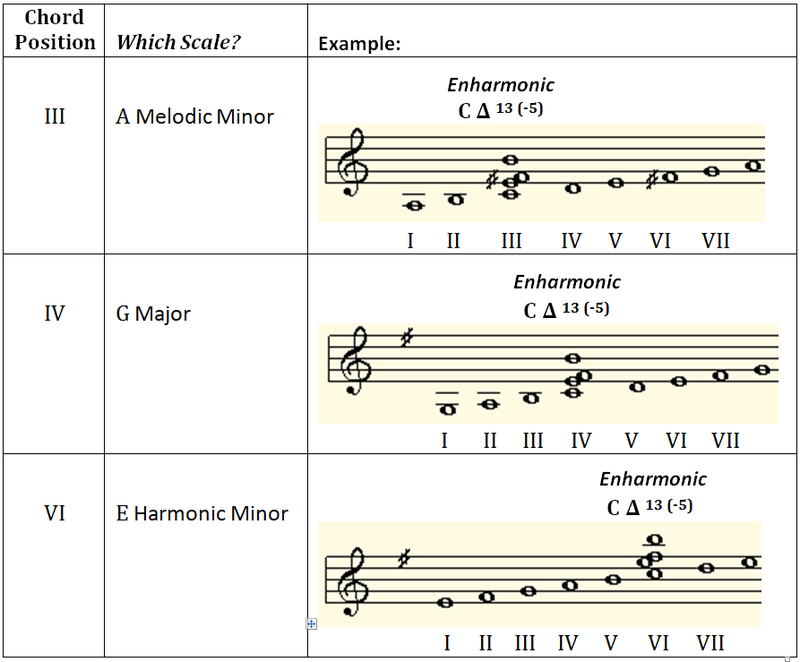 In traditional music there is no scale that includes a Major 7 (-5) Chord – however Jazz Theory allows the use of enharmonics to create equivalent chords. ONLY ONE SCALE: While there are three (3) scales listed, there is really only one (1) scale choice. ONLY TWO SCALES, However…: Traditional harmony’s melodic minor ascend as written (above), however it descends as a natural minor. Jazz theory seldom uses the harmonic minor and recommends using the melodic minor the same ascending and descending. Regardless of “proper minor key” – do you like the sound of the augmented 11th? (Only found in the recommended melodic minor scale). This entry was posted in Chord Theory, Improvisation, Jazz, Music. Bookmark the permalink. 2 Responses to MAJOR 7 ALTERED CHORDS: Which Scales Go with Which Chords?